Originally published under the title "Turkey's Naval Ambitions Boosting Local Industry." 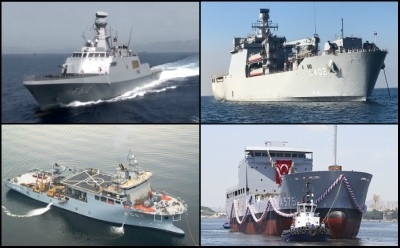 Turkish naval vessels recently produced by local shipyards include (clockwise from top left) two Ada-class corvettes, a landing ship, two logistical support ships, and a submarine rescue ship. At a recent ceremony for the launch of the TCG Kinaliada on July 3, Turkish President Recep Tayyip Erdogan, notoriously keen to develop Turkey's local arms industry, said that he was determined to follow plans for the local construction of an aircraft carrier. "We are determined to build an aircraft carrier," he said. "Turkey is one of the only 10 countries in the world that can design and build warships." 'We are determined to build an aircraft carrier,' says Turkish President Recep Tayyip Erdogan. Meanwhile, under a deal between the European Union and the International Organization for Migration, Damen, an international shipyard group, delivered on July 7 two SAR 1906 vessels to the Turkish Coast Guard. The two vessels — the first to be delivered in what is a six-vessel contract — will be mobilized in refugee and migrant rescue operations.